It’s not your fault – you didn’t cause it – IT DIDN’T START WITH YOU. What if this applies to some of your most difficult emotional and physical challenges in life? 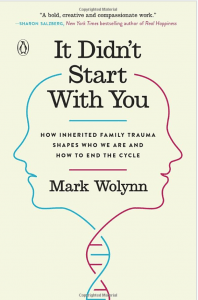 That’s the premise of Mark Wolynn’s healing work, encapsulated in his book “It Didn’t Start with You” and described with his own dramatic story of healing from blindness in the video below. In my own Break Free Fast healing and coaching work, with thousands of clients in the past 20 years, we usually find the source of physical and emotional pain and traumas in early childhood. But on numerous occasions the really confounding problems and patterns that were the presenting issues, came in what I call a big BREAK-FREE-AHA in which my client remembered a family secret, feud or tragic event that no one spoke about – directly linking with his present day challenges. What if inherited family trauma, secrets and lies – going back at least three generations – are shaping your life – and what can you do about it? To ascertain if indeed you are carrying the genes of your ancestors and their hidden, buried or unprocessed traumas and pain…Wolynn suggests you ask yourself the following questions and see, as you continue to probe, what words and sentences surface. Deepen the answer…if that happened…what’s the worst part of that – then what? And then what…worst part of that? I’d fall apart, let someone down, be blamed that it’s all be my fault; feel betrayed, humiliated, crazy… they’d lock me up…I won’t deserve to live…ABANDONED, BETRAYED. These sentences can originate in our family history in someone else like a grandparent. Who in your family shared this sentence…felt the same way? Grandfather, grandmother…father…look for the resonance of the sentence in your family history. Why do some traumas repeat? Wolynn says it’s when the healing is incomplete…people from past generations were excluded or rejected. Pain and Anger was never processed. When there is no healing or resolution at the time it happened, aspects of these traumas show up in future generations. Ultimately this trauma is seeking a chance to heal. The contraction in a trauma is ultimately looking for it’s expansion. What family secrets have been hidden? If we ignore the past it can come back to haunt us. But if we explore it – we can break past punishing patterns. Talk about and find ways to heal these traumas within ourselves so they are not passed down to future generations. We need to identify the trauma language and link it to the event so we can break the cycle and heal. Mark Wolynn talks about healing the brain’s super efficient trauma response. In EFT-Matrix Reimprinting we provide a safe space to release and heal this trauma response and over-ride the trauma memory with a new empowering memory. Practice the new way of thinking and experiencing life. Receiving comfort or support, parents, compassion for them…for us. Receiving or feeling gratitude, loving kindness especially for the part of us that got fragmented when we were young. ANYTHING THAT LET’S US FEEL STRENGTH AND PEACE INSIDE. Biological inheritance may be a reality – but it doesn’t have to be our destiny. If there is no clear memory though – because the trauma is *not* in your memory banks but someone else’s…..how do you resolve it? Matrix needs a memory, yes?